Where Are Google Search Cached And Similar Links? If you have been using Google Search in past years you may have noticed a cached and similar link next to nearly every search result on Google. The cached entry linked to a cached copy of the web page that Google stored on their own servers. The similar link on the other hand listed related sites instead. Webmasters know that Google saves information about every web page googlebot, the company's search engine crawler, visits. While it was not possible to access the cached link of every website in existence as some did not show up, it was a nice way of accessing a site's content in case that it was temporarily or permanently unavailable. Users were also able to access a site's contents without actually visiting that site. Handy in networks where that particular website was blocked. And the similar link feature was interesting to discover new related websites and services. Google has revamped the design of the results pages noticeably in past years. They introduced a permanent sidebar on the left linking to specialized searches and advanced filters. The company introduced so called instant previews of every site in the search engines. Two elements that have been removed in the process are the cached link and similar link. 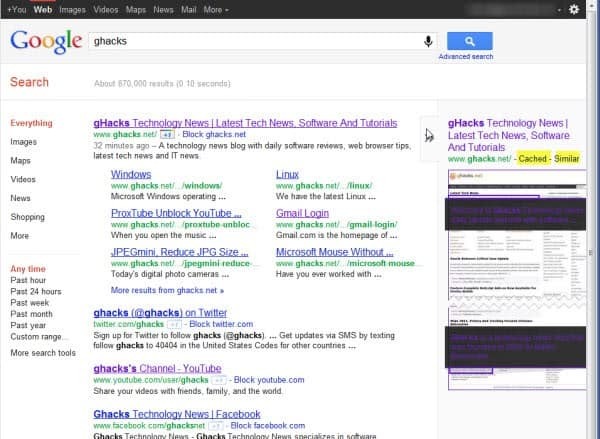 If you visit a Google search results page nowadays you will not find the cached or similar link there anymore. The links are still there but in hiding. Google has moved cached and similar links to the instant preview area. This is not as intuitive as it may sounds. You need to hover your mouse over a search result to display the instant preview arrows on the right of it. If you now move your mouse over that area you will see a screenshot of how the particular site looked on googlebots last visit. Displayed near the top next to the page's title are the cached and similar links. A left-click opens the cached or similar pages in the same tab, a middle-click in a new tab in the web browser. The problem being that I don’t want the preview, but I want the cache. But if I disable the preview “feature” I’m hosed in re: cached. There’s a Greasemonkey Userscript that restores the old functionality if anyone is interested. Yes, I found where cached is now (by intuition :) ), but I don’t like this Google decision. Since I dumped Google for Bing, those were the feature for what I used to visit Google sometimes. Now only if Bing can get these little features (and may be also change there orange colour scheme), then it will be fine for 99% of my search needs. P.S. Just noticed that FF spell checker accepts “Google” as correct word but not “Bing”. It suggest Sing, Ring, Ting, Ling, Ding as corrections. LoL. Using a “googleMonkeyR” userscript, I have no preview (disabled) and cached & similar sites are displayed as by the past. Without scripts I know I would have switched to another search engine since a long time. You are welcome. I’m happy they are still there, and with the userscript someone posted here it is even more comfortable. Tested the script right now and works fine! Thanks, Martin. Very helpful article. no one was using google preview, so they put the “cached version” link inside the preview. nice move google, FU!